Postpartum depression (PPD) is a type of depression developed by mothers who have given birth. PPD is the most common complication following childbirth, and it is estimated that 1 out of 7 moms are effected. It is a medical condition and requires treatment to get better. Here is what you need to know about postpartum depression and postpartum anxiety. Postpartum depression is a particular type of depression that effects mothers who have given birth. PPD typically consists of strong feelings of sadness that can lost long after delivery. About 1 in 7 women are effected making PPD the most common complication for women who have just had a baby. While PPD can happen any time after childbirth, it often develops 1 to 3 weeks after delivery. – It is NOT your fault. You didn’t do anything to cause PPD and it does not make you a bad person or a bad mother. – YOU ARE NOT ALONE. Many women have PPD. – You can get help and your depression can go away. Talk to you health care provider if you think you have PPD. There are many treatment options to get you back to feeling like yourself. IS PPD THE SAME AS BABY BLUES? No. 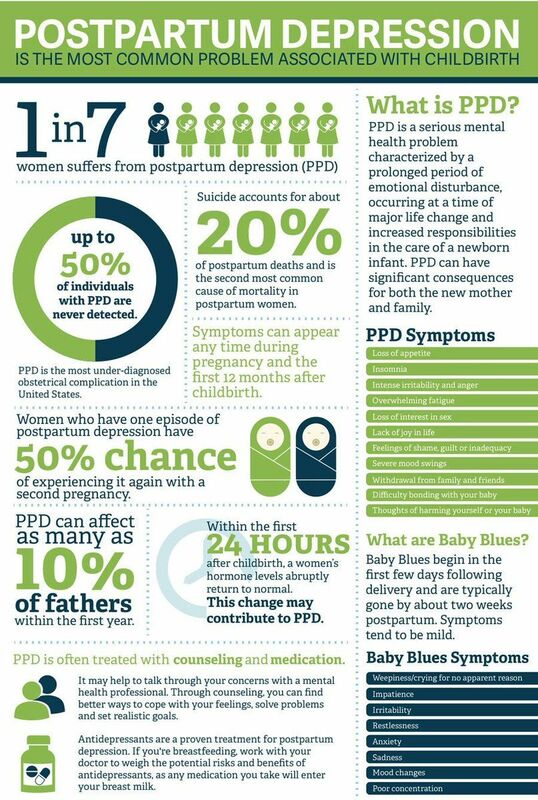 PPD lasts longer and is more serious than the “baby blues”. Often the symptoms of baby blue will hit within four to five days following childbirth. Some common symptoms are crying for no apparent reason, irritability, anxiety, fatigue, insomnia, sadness and mood changes. The symptoms of the “baby blues” normally occur for a few minutes up to a few hours each day. These symptoms should lessen and disappear within fourteen days after delivery. If they do not, your provider should evaluate you for PPD. No one is exactly sure what causes PPD. One of the most common suspects, is hormonal changes. Hormones are chemicals in your body. Some help control your emotions and mood. During pregnancy, your body has higher levels of the hormones estrogen and progesterone. But in the first 24 hours after giving birth, these hormones quickly go back to their normal levels. This rapid drop in hormone levels may lead to PPD. Low levels of thyroid hormones also may lead to depression. The thyroid is a gland in your neck that helps your body use and store energy from food. – Younger than 20 years old. – You’ve had PPD, major depression or other mood disorders previously. – Family history of depression. – Recent stressful events in your life, including but not limited to: death of a loved one, problems with your partner, money problems, difficult childbirth or pregnancy, etc. WHAT ARE THE SIGNS OF PPD? If you think you may have PPD, see a health care provider right away. Your provider can be the person who delivered your baby, like an obstetrician, family practice doctor or certified nurse-midwife. Or she could be your primary care provider or your baby’s provider. Or she can be a mental health professional, like a social worker, psychologist, psychiatrist or psychiatric nurse practitioner. To find out if you have PPD, your health care provider asks you questions about how you’re feeling. He wants to know if your feelings are causing problems in how you care for yourself and your baby. He may ask you to fill out a form called a depression screening questionnaire. Your answers on the form can help him find out if you have PPD. Your provider may do tests to see if you have other health problems that may lead to PPD. For example, he may check your thyroid hormones. Low levels of thyroid hormones may lead to PPD. Counseling. This also is called therapy. It’s when you talk about your feelings and concerns with a mental health professional. She helps you understand your feelings, solve problems and cope with things in your everyday life. Support groups. These are groups of people who meet together or go online to share their feelings and experiences about certain topics. Being part of a support group may help you feel better. Your provider can help you find a PPD support group near you or tell you about online groups. Medicine. PPD often is treated with medicine. Antidepressants. These are medicines used to treat many kinds of depression, including PPD. Some have side effects, like having a dry mouth or gaining weight. And some are not safe to take if you’re breastfeeding. Talk to your provider to find out about these medicines and decide if one is right for you. Estrogen. This hormone plays an important role in your menstrual cycle and pregnancy. During childbirth, the amount of estrogen in your body drops quickly. To help with PPD, your provider may suggest you wear an estrogen patch on your skin to replace the estrogen your body lost. If you are breastfeeding, check with your provider to see if the patch is safe for you to use. You can pass estrogen to your baby through breast milk. Don’t stop taking any medicines for PPD without your provider’s OK. It’s important that you take all your medicine for as long as your provider prescribes it. Some medicines used to treat depression have side effects if you stop taking them too soon. Follow your provider’s instructions about how to take your medicine. Some medicines used to treat PPD aren’t safe for your baby if you’re breastfeeding. Talk to your provider to make sure what you’re taking is best for you and your baby. Some people use an herb called St. John’s wort to treat depression. We don’t know how safe this herb is for women with PPD. More research is needed. Until we know more about it, don’t take St. John’s wort for PPD. WHAT CAN YOU DO TO HELP YOURSELF FEEL BETTER? Do something active every day. Go for a walk or get back to the gym. Eat healthy foods. These include fruits, vegetables, whole-grain breads and lean meats. Try to eat fewer sweets and salty snacks. Get as much rest as you can. Try to sleep when your baby sleeps. Don’t drink alcohol. This includes beer, wine, wine coolers and liquor. Alcohol is a depressant, which means it can slow your body down and make you feel more depressed. It also can interact with the medicine you’re taking for PPD. It’s never a good idea to drink alcohol if you’re breastfeeding. This is because you can pass alcohol to your baby through your breast milk. Don’t take street drugs. These affect the way your body works and can cause problems with the medicine you’re taking for PPD. You also can pass street drugs to your baby through breast milk. and friends how you’re feeling. Let others help around the house. Ask your friends and family to watch the baby, help with housekeeping or go grocery shopping. Don’t be afraid to tell them what you need. Do the things you liked to do before you had your baby. Listen to music, read a good book or take a class. Do the things that used to make you feel good about yourself before you got pregnant. Try not to make any major changes in your life right after having your baby. These include moving or changing jobs. Major changes can add stress to your life that you don’t need right now. Talk to your boss about going back to work. Maybe you can work at home or part-time when you first go back to work.